Coercion by itself is a dangerously narrow base of power. As Bismarck said, the one thing you can't do with bayonets is sit on them. States and other political entities – those of the past, and those of the future – depend on legitimacy, which transmutes the iron of naked power into the gold of authority. I have speculated before on this blog about the different forms that power politics of the future might take from the familiar state system of the relatively recent past. But whatever the structures, they are unlikely to stand up very well unless they they can also transmute power into authority with something approaching the efficiency that states have achieved. For this reason – to grab a handy example from the bag – those futures dominated by megacorps, corporations writ mighty, face a basic challenge, or at any rate the megacorps do. If they are to survive in power very long they will need a lot of brand loyalty. And the legitimacy problem does not just apply to general populations. Most immediately it applies to the human instruments of power. From Lawyers, Guns, and Money, via Kung Fu Monkey ('Your monkey's kung fu is not strong'), a thought provoking essay on how power is lost in the current era. Here's the nutshell passage: It deals with a late 20th century event, but the intended context is early 21st century, in fact immediately contemporary. Its implications for the broader future should be obvious. Tank Commander is far more dangerous than Tank Man. Tank Man can simply be shot; most seem to believe that Tank Man was later executed, far out of sight of the international media. The regime survives if Tank Man dies, even if the death of Tank Man isn't the optimal outcome. The regime dies, however, if Tank Commander refuses to run over Tank Man. Eisenstein used the Odessa Steps to demonstrate the corruption of the Czarist regime, but the regime didn't die until the soldiers refused to shoot the demonstrators. The successor regime didn't die until Boris Yeltsin climbed on a tank in August 1991. While there's some mystery as to the fate of Tank Man, I don't doubt that the CCP found Tank Commander and put a bullet in the back of his head at the first opportunity. Read the whole essay. Discuss. Related links: I discussed the Westphalian state system – AKA the universe of the 'Diplomacy' board – and its possible successors here and here, and applied it to a speculative scenario about Mars here. Legitimacy always seemed to be the weak point of megacorp futures. While the corporations in these settings had power, they never seemed to have a mechanism for making people accept that power as legitimate. Brute force is deeply unstable, and has to be applied constantly at great expense. And history is full of one-industry company towns where brute force failed to prevent riots, strikes, and unionization. And then there are services... Given the example of private health care in the US, where the company has an incentive to find excuses to not provide the services its customers pay for, how does the 'citizen' of a megacorp receive any services? Libertarians and anarchists like to say that the state does nothing but monopolize force, and any services it provides could be better provided by free individuals. But historically free individuals have always chosen to be members of groups that control violence and provide services, so that really does seem to be part of being human. Those last two are probably how a megacorp would seek legitimacy. Military aristocracies tend to reach for tradition and religion. Democracies use councils and voting. Any of them could come to use inheritance under the right circumstances, and all of them are influenced by kinship. Interestingly the state that is most dependent on economic power - And the dense web of economic connections between its people - is the city-state. I'm inclined to agree with Jane Jacobs that cities are the primary engine of economic growth, for good or for ill. You can dress it up with appeals to the demos or polity and local gods, but ultimately people live in the city because it's better than grubbing for seeds on the farm (Obviously farmers disagree). Megacorps were popular during the Reagan-Thatcher era and the globalization boom that followed. You'd have a hard time convincing someone to give their loyalty to AIG today. But kinship and immediate economic needs are powerful ties, and can often over-rule other forms of power. I'm betting money that we'll see more SF dealing with tribalism, city- or regional-based governments, and internet economies in competition with traditional nation-states. The city-state and megacorporation tropes would be different, but you still need some sort of higher-level authority...whether it be an informal debate forum (read: a private room where the big-wigs can shout at each other), or something more structured; like a coordinating council. A world with domed/underground city-states may need to have some sort of coordinating council to regulate trade/travel/commerice and to mediate disputes between city-states. The representitives on this council would be picked by whatever method each city-state chooses; voting, appointment, ect. A world where a group of megacorporations provide all goods and sevices. A system must be put into place for the powers-that-be to resolve disputes (without constant warfare; it's only good for business when someone else is fighting). Knowing that the general population will only put up with the system so long as it doesn't abuse the people too badly...and they do something perminent to the former power-that-be. Empires have have been successful when they credibly associated themselves with peace and public service. Rome is the familiar Western example; it 'only' lasted 400 years (in the west), but romanitas outlasted it by more than a millennium. China did even better, establishing unification and the mandate of heaven as a norm that still essentially holds. That said, I also agree about cities, and see something like city states as a plausible future option. Ferrell - Well, you don't need a central coordination, but you'll probably run into trouble without one. While city states both in ancient Greece and medieval/Renaissance Italy fought like cats and dogs, in Germany the Hanseatic League functioned well for several hundred years. And modern Switzerland is a similar federation, though of mostly rural cantons rather than towns, that has survived to the present, though gradually taking on the form of a more or less standard European state. But there is a paradox in federalism that I've rarely seen discussed. The members of a federation are largely sheltered from Darwinian politics by the federation itself, and are thus free to be irresponsible. You can see it, in a minor way, in the often embarrassing fecklessness of US state legislatures. While it's not really legitimacy, life in space relies completely on the infrastructure, so the ones controlling it have the ultimate veto power, you do what they say or they turn off your air. It's possible that different elements of the infrastructure could be controlled by different groups, but they would have to work together to make it all work. That would be the kind of situation where the population starts thinking 'IEDs + deadman switches = constant air supply'. Turn off the air, and the whole station turns into floating debris. Brute force or the threat of force only works if you have an absolute monopoly on force. Space habitats are too fragile for that sort of absolute monopoly. Oh, & Rick: I've seen some US commentators speculate that the federal minimum wage, Medicare, and other federal programs are what lets Texan politicians get away with saying people don't need minimum wage laws or state medical programs. They can have their minimalist government and Libertarian rhetoric at the state level, but still keep the population reasonably healthy by using federal resources. Not sure how true it is - I don't know enough about US politics and socioeconomics to say - but you're not the only one to think along those lines. These points are why I find the ('Murrican, at least) cultural nexus between space geekitude and libertarianism to be very odd. Spacehabs might be independent as communities, but absent magitech there is no place in space for rugged individualism. Space populations will necessarily have a very communitarian ethic. Again; enviornment dictates the limits of freedom. on Luna, Mars, and Titan, for example, air isn't free. The story "the Moon is a Harsh Mistriss" offers many examples of this concept. However, a colony on an Earth-like world should have many of the same freedoms that the homeworld does. That no one should have more freedom than his fellow citizen, should be central to any human community, dispite it's size or scope. We know that, in practice, that doesn't always follow. Pity, that. An upper-level authority may not be present, but needed. A collection of city-states, in many ways, resembles a group of people; without an overall mitigating body, disputes deteriate into conflict and individual ambitions flair up into warfare. Groups of people tend to act like the most immature of their members, unfortunately. Upper-level governments, no matter how limited or expansive in size and scope, is a nessicery evil. Yes, shirtsleeves habitable planets are more 'permissive' than spacehabs or domed colonies. But if a planet has one landowner, it can be perfectly libertarian in theory, perfectly autocratic in practice. And if the economic system is anything other than household subsistence, interdependence develops, and needs to be socially managed. Oddly enough, the biggest conceptual problem for libertarians is not Karl Marx but Adam Smith. A collection of city-states, in many ways, resembles a group of people; without an overall mitigating body, disputes deteriate into conflict and individual ambitions flare up into warfare. Special Drawing Rights work well as an international 'currency', but even in a unified world federation I wouldn't like to see any currency more centralized than that. European Union, good. Euro, bad. I'm not worried about monetary sovereignty, I'm worried about global economic bubbles. On the topic of future power politics - Iran is giving us a real-time example of what happens when a sizeable chunk of your population loses faith in the government. Each use of force in the streets just chips away at the state's legitimacy. Even if the current Iranian regime manages to put down the protests and strikes, an entire generation of Iranians will view the powers-that-be as the people who killed their friends and family in the streets. And a week ago none of these people wanted to rise against their government. They wanted a voice in that government, and a change in internal policies and how Iran dealt with the rest of the world, but they viewed their government as fundamentally legitimate. In the space of a few days things went from "The system isn't perfect but we can work within it to improve things" to "DEATH TO THE TYRANT!". From shaky legitimacy to no legitimacy in a week. And as I understand it, the Libertarian movement didn't start talking up space habs until their attempts to take over a few islands in the Pacific crashed and burned. Libertarianism has a terrible track record here on Earth, but Hey! Maybe in space! Iran has headed into a crisis of the regime with shocking suddenness, hasn't it? As you say, even if the hardliners assert control, they will be on extremely shaky ground. Tienanmen Square had no impact on most Chinese; whatever the short term outcome what is coming down in Iran is on a whole 'nother scale. Libertarianism seems to have the same purist appeal to engineering types that Communism has to philosophy types, and since the 1960s has been the characteristic form of political crankery in 'Murrican SF. But ships? That's an awesome triumph of faith over experience. Or, as you suggest, inexperience. "Yes, shirtsleeves habitable planets are more 'permissive' than spacehabs or domed colonies. But if a planet has one landowner, it can be perfectly libertarian in theory, perfectly autocratic in practice." I think you mean the Landowner can let his world be as libertarian or autocratic as he wants. Or so he thinks. But the broader point, which you obliquely make, is the complex relationship between economic power and political power. If you have enough of one, you also have the other, or can if you want to. I disagree with the author's advocacy position, but he's pretty much right about the nexus. Working on the background for Tri Tac Games' FTL:2448, I worked out the background for one of the major space ports: Alverez Station, in orbit about Fomalhaut V. The station has been in operation for close to 300 hundred years and the station corporation maintains its control through behavioral conditioning. By doing this, the Alverez family maintains control of the station and runs it like their own private fiefdom. "Incidentally, though I mostly try to keep my politics out of this blog, I cheerfully beat up on libertarianism here because of its prominent role in SF. I disagree with the author's advocacy position, but he's pretty much right about the nexus." I read that article; I'm still thinking about it, but I do think that if a body of writing resonates with its readers over the course of generations, then perhaps its core values are worthy of respect and contemplation. On another note: what form would a future version of a 'water empire' likely to take? A monopoly on electricity? complete control of medicine? Perhaps total control over the flow of information? would it be a corporation, a formal governing body, or even a private society? A more subtle, but just as potent, form of political power. Kedamono - Which raises a whole host of issues regarding 'new' forms of social control. Presumably behavioral conditioning seeks to do systematically what human cultures have traditionally done by (frex) religious indoctrination. But like Shia theocracy in Iran, it probably has its failure modes ... probably unexpected ones. Ferrell - I'll probably do a future front page blog post about this, because whatever I think of libertarianism it has a unique role in SF (at least 'Murrican SF) that sets it apart from any other political perspective that I can think of. Two sources come to mind, one general and one specific. The general source is the Western frontier experience; the specific one is Heinlein, whose influence is hard to overstate. For what it is worth, I am a continuing fan of RAH's juveniles of the 50s - including the expelled bad boy, Starship Troopers - but his two most famous books from a decade later, The Moon is a Harsh Mistress AND Stranger in a Strange Land, both did nada for me. Cause, effect, or both? Further previewing my thoughts on that essay, the author really sidesteps Starship Troopers! He wants to banish the Pournelle/Drake wing to the galactic rim, but they are also Heinlein's children, as the publisher of Baen Books clearly understood. I really don't think David Drake belongs in that category - he's decidedly not a right-libertarian. Centrist, with a slight lean to the right, perhaps. I mention this only because many of Drake's stories (especially the earlier ones where the experience of Vietnam was clearly fresh in his memory) are extremely ambiguous about war and the business of soldiering, and have none of the idealization of the soldier as a decision-maker that makes people like Pournelle especially so repellent - in many of his stories soldiers are simply more scared people, only they have very big guns. Drawing a parallel between his experience as an American soldier in Vietnam and brutal interstellar mercenaries is also the kind of uncomfortable statement that doesn't sit well with that crowd. It's really Drake's slavering fanboy horde that was responsible for most of the later scariness. Anon - I lumped Drake and Pournelle together because the author of the essay did. He wants to exile both of them, and by implication 'military SF' as a whole, from the mainstream of hard SF, in order to bind hard SF closer to libertarianism. Meta note that I walk a bit of a fine line on this blog. The subject matter includes politics, and it would be silly, dishonest, or both to pretend that I'm not political. OTOH, I've drifted away from some SF blogs that got too wrapped up in current politics, even when I agreed with the stance. In fact I'm thinking of starting a political blog, so I can bloviate without inflicting it on my readers here. That ambiguity about war and soldiering is one of my two favourite things about Drake. The other is his skill as a classicist. A lot of his fans miss out on both aspects, and just read him as an adventure writer. I'm not sure the person who wrote that essay has really read a lot of Kipling. Kipling was always interested in work, in what people did, how they did it, and how their work supported society. He was also interested in the workers, and respected them regardless of IQ and education. Heinlein wasn't and didn't. On the meta-note, any discussion of writing is going to bring up politics. Even is you're just talking the business end of publication rights, royalties, and copyright. The one Drake I've read is The Voyage, unabashedly swiped from the Argonautica. I haven't read more because it didn't particularly fire me up. But it did not annoy me the Pournelle does. Or late Heinlein. Heinlein in his earlier work, especially the 50s juveniles, was a much better writer in nearly every way than he became later, including a broader perspective on humanity. The turning point, IMHO, was Starship Troopers, where his later crankishness is coming into play but does not yet ruin the book. After that he goes downhill fast. 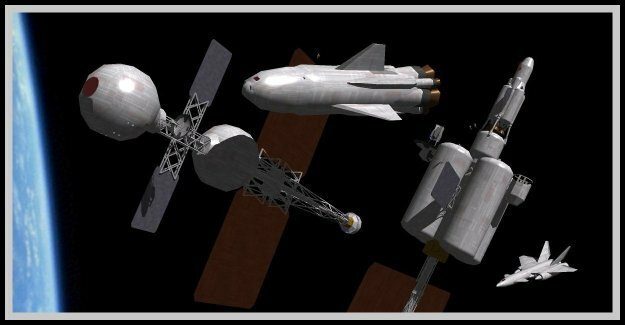 Space Warfare III – 'Warships' in Space?